A beautiful stone church. The doors are bright red, and the interior has beautiful wood floors and stained glass windows, with a vaulted ceiling. The organ pipes are visible, but understated. The altar is against the east wall, and above it is a large window that depicts Christ. Separate from the church itself, but next door, is a building that apparently houses the offices and so forth. Their website lists ministries such as a free clinic, a soup kitchen, an after-school program, and a community garden. However, I was not able to ask about these ministries in the time I had with them. Decatur is a railroad and river town located on the Tennessee River in north central Alabama. It was named after Commodore Stephen Decatur, a naval hero responsible for decisive victories in the First Barbary War and the War of 1812; five warships and forty-six municipalities have been named in his honor. It is a bedroom community for Huntsville, as well as being home to several industries, including Meow Mix cat food. The part of town where the church is (Gordon Street, near downtown Decatur) has many old houses and borders the railroad yard. There is a mixture of middle class and lower-income families in the neighborhood. The Revd Evan D. Garner, rector, celebrated, and the Revd J. Seth Olson, curate, preached. They were assisted by Nell Strandridge as lay eucharistic minister, and Chuck Puckett as reader. There were about 25 people in attendance, gathered mostly toward the front of the nave. It was perhaps a quarter full. As we entered, we were warmly greeted by two ushers who were giving out service leaflets. Everyone inside was sitting quietly, and no one was talking to anyone. While not exactly as comfortable as my favorite arm chair, it was pretty comfy. It was a wooden pew without cushions, but it was shaped such that it didn't feel hard at all. The pre-service atmosphere was quiet reverence, which was nice  especially after the hustle and bustle of the previous few days. I liked the opportunity to settle and center before the service began. "Blessed be God: Father, Son, and Holy Spirit." The 1979 Book of Common Prayer. No instruments were played; it was a spoken service. The only music was the greater doxology, which was sung a cappella by the whole congregation. Someone nearby was wearing strong cologne, which irritated my eyes. Other than that, it was a lovely service. Interestingly, it would probably be characterized as low church Anglican. The celebrant was vested in surplice and white stole, and the entire service was spoken, although he celebrated ad orientem instead of on the north side. 7 – The curate spoke well, establishing good rapport with the congregation. His accent was clearly a product of his years spent at seminary in Texas as well as his upbringing in Alabama. The sermon was based on the gospel passage, John 1:1-14 (the Word became flesh). It began with a game, where the preacher brought out three gifts and asked the congregation to guess what they were. The first one was obviously a lampshade, and the second one ticked like a clock. The third was a box, and when opened it was empty. His point was that some gifts cannot be seen. He then talked about how Christ is the gift that we cannot see, but that he is still a good gift. The eucharist is always my favorite part of the service. The reader was also very good, and that is a heaven all it's own. 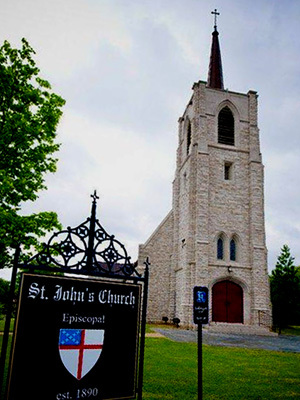 The congregation didn't seem overly friendly, which was surprising  almost all Episcopal churches I've visited have been very warm and welcoming. Perhaps today was unusual. Everyone left rather quickly after the service, so we weren't able to wait long. The priests thanked us for coming as we exited the building. There was no coffee offered, so I cannot say. 7 – A beautiful church, exciting ministries in the community, and inspiring worship rate highly with me, but I value a friendly, inviting congregation as well. Hopefully, I just was there on an off day.